It comes in many forms and flavors, but it’s got to have that classic formula of crust, tomato sauce, and toppings. While we all have our go-to pizza favorites, it's time to recognize pizza's fraternal twin brother—the flatbread pizza. Pizza chains have been experimenting with gigantic sizes and stuffed crusts, but it’s with the flatbreads that the culinary world gets more creative with the signature combination of dough and melted cheese. For one, it can carry an assortment of heavier toppings. Flatbread recipes can also opt not to include sauces of any sort. Ultimately, it’s the flatbread’s imperfect rectangular shape that sets it apart. It’s also important that it has a charred and crispy crust on each side, made possible by brick or stone ovens. 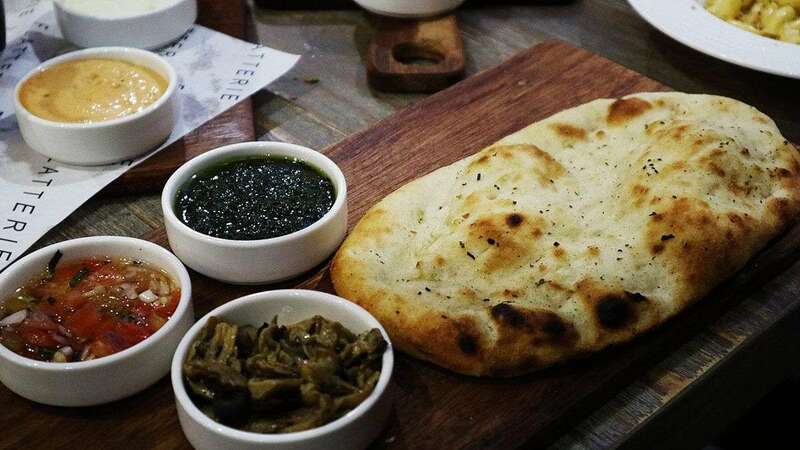 You can easily spot flatbread at bakeries and buffets—although it’s not often seen taking its premiere form, easily pushing it down the gastronomic food chain. 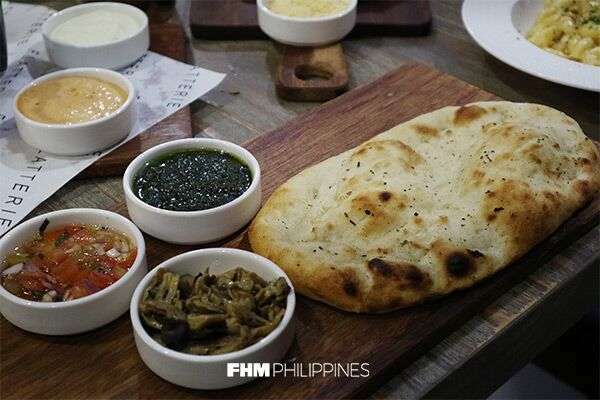 But Mall of Asia’s newly opened Flatterie gives justice to the long-ignored flatbread, and it will only take a quick visit to this small, laid-back restaurant to have you agree. “Flatterie is our third spinoff of the Todd English Food Hall. We wanted to take our food hall’s flatbreads to the next level. You have Pound doing your burgers, Hook focusing on seafood, and now Flatterie specializing on flatbread and pastas,“ Eric Dee, multi-brand food empire Foodee Global Concepts president, says. “We push our dough to be on the charred side, which a lot of people here define as burnt. But it adds a layer of flavor, and a flatbread really has to have that charred edge and those toasted bits,” he adds. 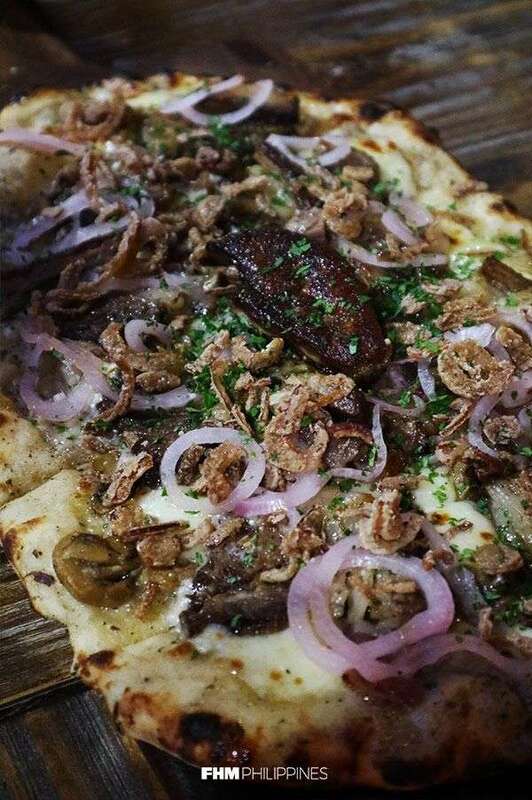 Flatterie’s Truffle flatbread makes its presence felt before it is even welcomed to the table. Its aroma instantly fills the air and effortlessly sets up your appetite for a huge and filling meal. You’ll find generous swirls of truffle cream drawn on a cheesy bed of mozzarella and parmesan on the Truffle flatbread. Eric says it works best with a bit of chili oil, but we think it’s already perfect on its own. If you can’t get enough of their truffle cream (which is completely understandable), order some of their truffle spaghetti. The creamy sauce, but dusted with parmesan and topped with a runny egg yolk, is guaranteed to unseat your Italian favorites. Now, every restaurant has their own blockbuster hit. For Flatterie, it’s undeniably the Indulgence flatbread. Not only because it’s the priciest on the menu at P890, but where else can you find the scrumptious pairing of truffled steak slices, a whole piece of foie gras, and a mouthful of gooey mozzarella on top of a perfectly charcoal brick oven-baked bread? This flatbread is probably the most sinful one out there. The steak toppings are marbled with fat trimmings and cooked in truffle oil. The mix of caramelized shallots and deep-fried crispy mini onion rings also give the Indulgence interesting textures and a much-needed sweetness. “If you look at our menu, everything’s affordable, but the Indulgence is Flatterie’s outlier. Here, the inspiration is basically combining fine-dining steak and foie gras with food you can get to enjoy everyday,” Eric explains. Tangy and chewy, the Roast Beef flatbread breaks away from the rest of the flavors on the menu—but you know you won’t ever go wrong with cheese and brisket together. It’s also got sweet notes to go with the fluffy flatbread center. 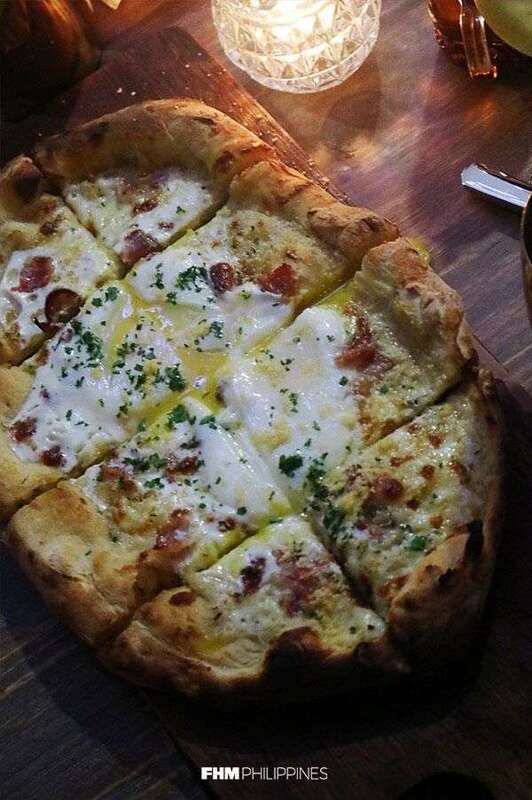 The Carbonara flatbread is a bit messy to eat with a sous-vide egg carefully spread all over it. This is the creamiest Flatterie concoction, and its rich and silky texture needs to be balanced with more toasted bacon bits! If you’re a fan of the tasty medley of sweet-and-savory, then give the Fig and Prosciutto flatbread a try. The saltiness of the Italian meat is complemented by the fruity flavor of the dried fig bits. Flatterie also has desserts in their lineup. 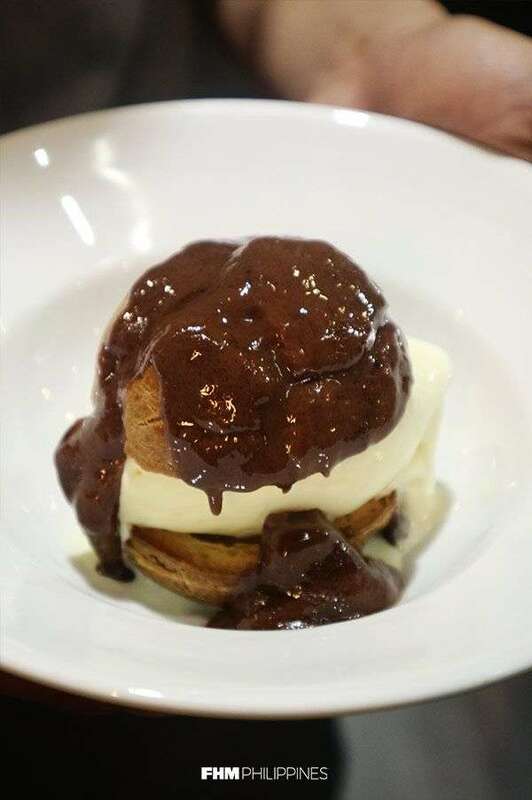 The best option is their Ice Cream Puff, which is topped with a dollop of chocolate hazelnut spread. The flaky puff pastry sandwiches a scoop of creamy vanilla ice cream, where each bite is a melt-in-your-mouth experience. At night, the comfort food nook transforms into a more intimate setting, where the warm light of its halogen bulbs illuminate the space. The tables are also set with candles, where you can enjoy your wine or ginger ale paired with your flatbread and pasta of choice. 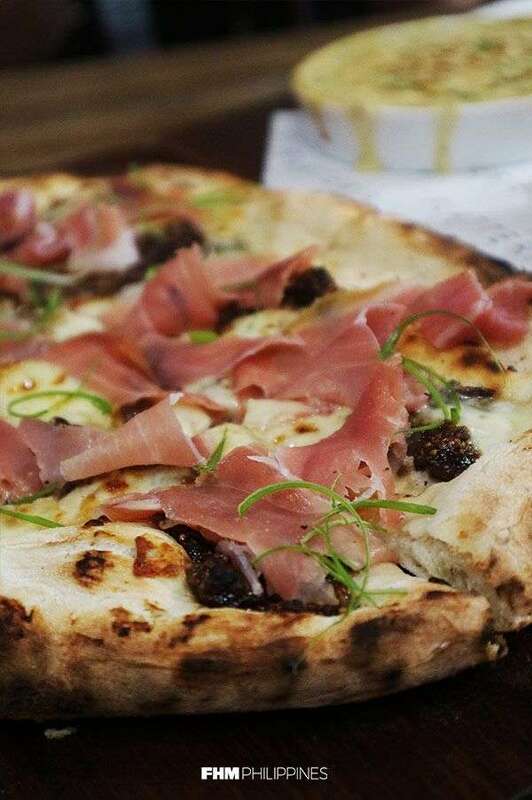 Flatbread pizza might seem like an alien dish, but Flatterie’s offerings provide a mouthwatering goodness that puts a spin on traditional pizza. But this time, trust that you won't be discarding those smoky-flavored crusts. 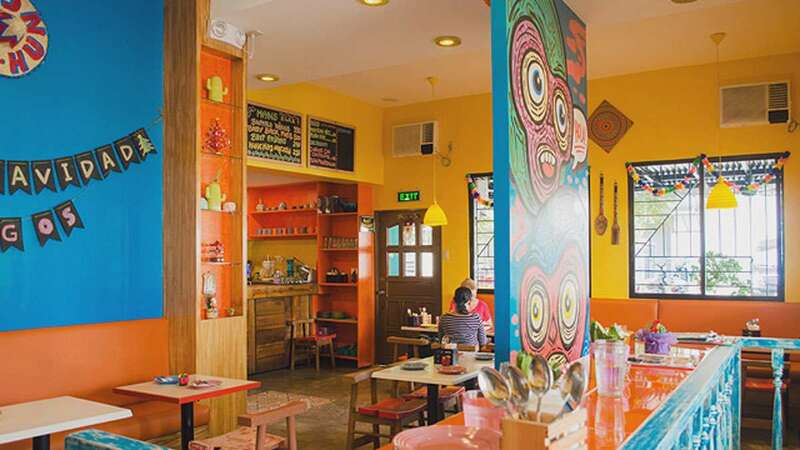 The newest addition to Foodee Global Concepts also has an ongoing promo for their diners. 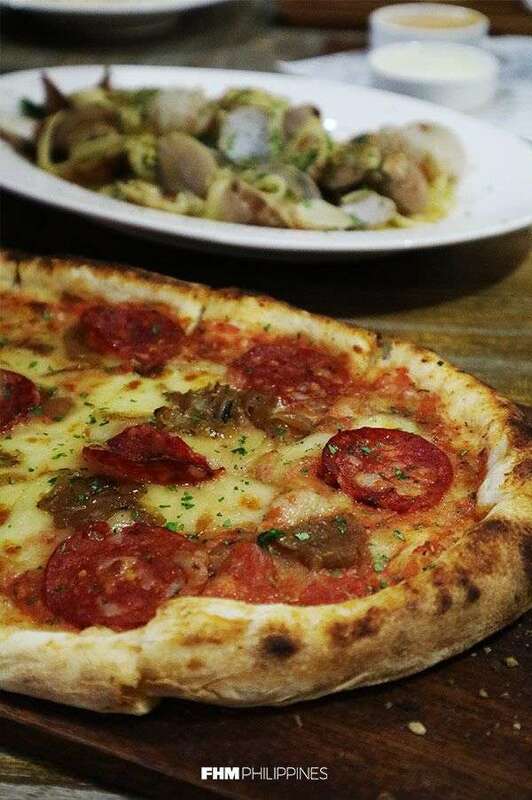 The Truffle, Carbonara, Classic Margarita, Sausage & Pesto, and Clam & Bacon selfie-sized flatbreads are only P100 each from December 6 to 14.